Here is a link to our petition to communicate to the Albuquerque City Council that they should tell the federal government to stop aid to Israel until that country abides by international law. Click here to read our background statement and here to read our proclamation. The woman who has just had her home destroyed lives in the Palestinian village of Anata. For more information on this village click here. Evidence of the root of this conflict was seen in 1979, twelve years after the Six Day War. Click here to read more about this. 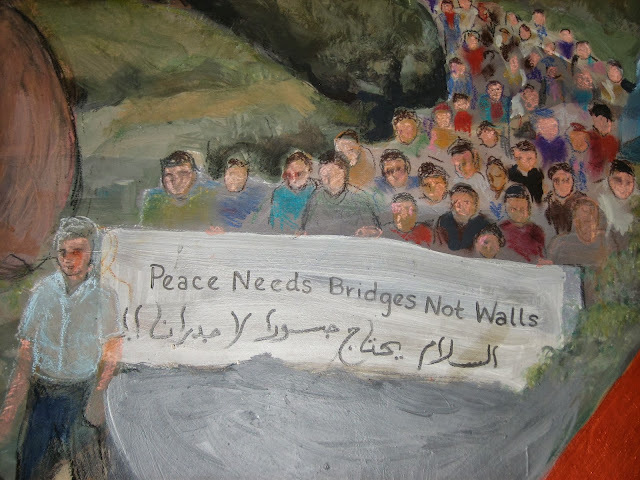 Jewish Voice for Peace-Albuquerque is a peace group dedicated to supporting equality, democracy, and human rights based on international law for all Israelis and Palestinians. Our events and programs increase awareness about current conditions in Israel-Palestine. They also provide an alternative Jewish voice, one not often heard in the media. We believe in self-determination, peaceful co-existence and security for everyone. We believe that U.S. military aid to Israel must cease until the Occupation of the West Bank, East Jerusalem and Gaza ends.